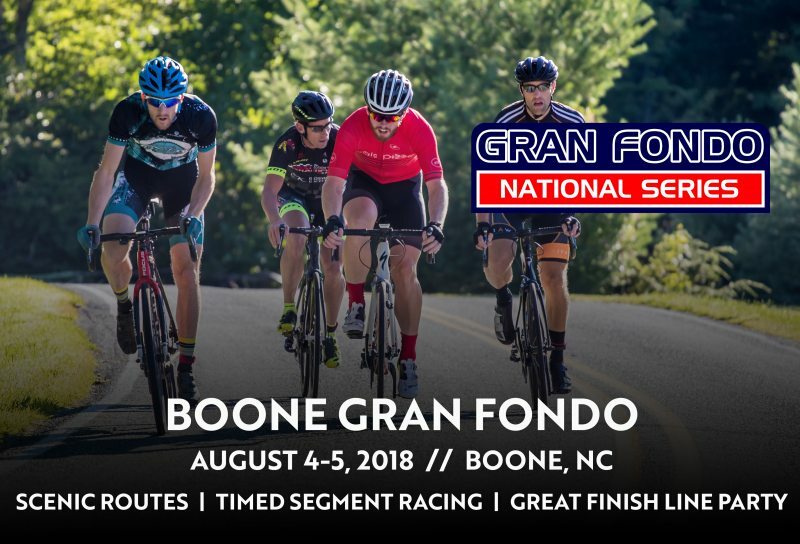 Escape the heat with a great weekend in the mountains August 4-5 for the sixth annual Boone Gran Fondo, part of the Gran Fondo National Series and an event Men’s Journal called “one of the best Gran Fondos in the country”. Located at 3,333 feet above sea level in the Blue Ridge Mountains, Boone enjoys summer temperatures that are typically 10-15 degrees cooler than areas like Charlotte, Winston-Salem, Greensboro, and Raleigh. The weekend kicks off with an optional hill climb time trial on Saturday, August 4. Cyclists will take off down a professional start ramp to begin the climb to Howard’s Knob County Park. This challenging ride climbs 1,180 feet in only 2.1 miles, and rewards riders with incredible views of downtown Boone and a fun descent back into town. Sunday morning, riders will roll out of Appalachian State University for their choice of a 20-, 55-, or 100-mile route on quiet country roads. After paralleling the Blue Ridge Parkway, passing Grandfather Mountain State Park, and riding through Linville, the 55- and 100-mile routes split in Newland. The 55-mile route turns northeast to pass through Banner Elk before a thrilling descent into Valle Crucis and a cruise back into Boone. The 100-mile route leaves Newland to circumnavigate Beech Mountain, including a long climb on the mountain’s west side and a brief trip across the border into Tennessee, before turning back toward the finish in Boone. Riders on all routes will enjoy fully stocked aid stations to refuel and stay hydrated. A hallmark of Gran Fondo National Series events, each route at the Boone Gran Fondo features at least one timed segment. The Piccolo (20-mile) route has one timed segment, the Medio (55-mile) route has two, and the Gran (100-mile) route has four. Timed segments give athletes a chance to challenge themselves and compete against each other to have the fastest combined time by the end of the day. This increasingly popular format allows riders to race for shorter distances within a longer ride, while also enabling them to regroup, ride with friends, stop at aid stations, and enjoy the great views. There’s no better way to finish a long ride than with hot food and cold beer, and both will be waiting for Boone Gran Fondo riders at the finish line party! In addition to awards for the fastest men and women in a wide range of age categories, many lucky riders will win raffle prizes from Boone Gran Fondo sponsors, including a USA-made Litespeed titanium frameset, a Sea Sucker bicycle rack, Cane Creek eeBrakes, a trip for two – meals included – to the Garda Bike Hotel in Italy, and many more. Thanks to a partnership with Haute Route, all riders can also apply their Boone Gran Fondo entry fee toward the purchase of any 2018 Haute Route cycling event. For registration and event details, visit granfondonationalseries.com.